Made for easy living, luxury vinyl flooring shows us that having a beautiful home doesn’t have to come at a hefty cost. Today’s manufactured flooring is light years away from yesterday’s drab linoleum squares. Regardless of your style, luxury vinyl has just what you’re looking for: from tried-and-true classics to cutting edge contemporaries. Built to last and endure, luxury vinyl has a whole armory of impressive capabilities. Do you prefer nature-inspired visuals and textures? There are plenty of vinyl options that perfectly capture the look – and feel- of organic stone and hardwood. Or, perhaps you’re more drawn to the colorful, creative possibilities of ceramic tile? Not to worry: luxury vinyl tile presents a plethora of artistic choices. Whichever you choose, you’ll rest easy knowing your floor will stay safe and unblemished, even when things get a little crazy. Does this all sound too good to be true? We assure you, luxury vinyl flooring truly has it all. Let’s take a closer look at this truly remarkable flooring family. Luxury vinyl flooring, or LVT flooring, has become more and more popular in residential and commercial settings. 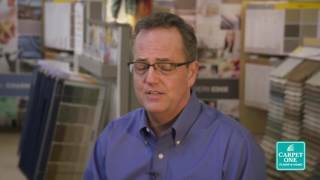 Join our very own Jim Aaron, VP of Merchandising for Carpet One Floor & Home, for some inside information about luxury vinyl. Offering up thousands of choices for your home or business, luxury vinyl truly represents endless possibilities. A floor for all of your favorite interior spaces: luxury vinyl flooring works just about anywhere. With a durable coating to ward off moisture, scuffs, and scratches, luxury vinyl is a great option for high-traffic areas. In addition, there are many, many different colors, styles, and patterns to choose from, making it easy to bring your vision to reality. Since there are several distinctive forms of luxury vinyl flooring available, you can easily customize your look. While there are truly no wrong choices when it comes to luxury vinyl, there are some distinctive traits to consider as you navigate the flooring world. Sheet vinyl, for example, is one of the most economical flooring mediums on today’s market. For those seeking the most realistic hardwood-inspired looks, luxury vinyl plank is the perfect “imposter,” offering up all the textures and visuals of hardwood, minus the hefty cost and the high potential for water damage. Or, there’s also luxury vinyl tile for those who love stone or ceramic styles. Do you still have questions about which type of luxury vinyl flooring might be the right choice for your space, your style, or your budget? Relax: we’re here to help! Nonetheless, luxury vinyl looks like real wood or stone, but because of its synthetic construction, it is much more durable. Luxury vinyl flooring, for example, has a super-strong top layer that resist scratches and scuffs, so it does not need to be finished and refinished. More importantly, luxury vinyl is totally waterproof, so it can be installed in kitchens, bathrooms, and other areas where moisture is an issue. The vinyl planks and tiles will never swell when exposed to moisture, and moisture also will never reach the subfloor. At McCalls Carpet One Floor & Home, we’re always keeping up with the latest and greatest in luxury vinyl products for our discerning customers. That’s why you’ll find some of the region’s most comprehensive product selections in both our Nashville and Franklin, TN showrooms. As part of Carpet One Floor & Home, we offer the buying power of over a thousand stores around the continent, but with the localized and friendly services you’d expect from a small, neighborhood business. Invincible H2O is waterproof, kid-proof, and pet-proof. Invincible XT features a rigid core construction. Invincible LVT is a durable alternative to wood and stone. Luxury vinyl plank flooring is made to look just like real hardwood flooring. Learn more about luxury vinyl planks here. What is Luxury Vinyl Plank? Learn about our waterproof flooring options for your home.